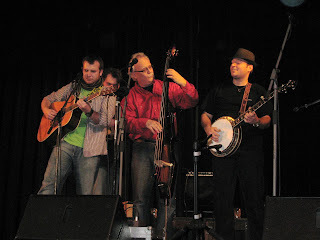 The last CzBMA Newsletter brings an interview with veteran bass player, singer, songwriter Petr Vacek; Lilly Pavlak's memories of banjo maker Robert Lauer (a Czech banjo maker living in Switzerland); a description of the concert celebrating 20 years of Monogram; and 10 years of bluegrass charity concerts in Usti na Labem. CD reviews include Poutnici celebrate 40 years - LIVE. Slovakian dobro player Henrich Novak started a new bluegrass travel agency organising trips to places where bluegrass and country music started. More info at www.resotravel.sk. Prague luthier Rosta Capek organised another concert in the theatre Koppernik. 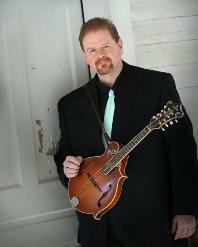 Mandolinist Mike Marshall played with his partner Caterina Lichtenberg (in her eighth month of pregnancy!) from Germany a lot of classical and Brazilian music. In the second half of the concert he was accompanied by Czech players - Ondra Kozak (g), Milos Klapste (bs), Pepa Malina (f), and Petr Brandejs (bjo), along with a phenomenal pianist, Petr Malasek. They played some bluegrass as well as some of Mike's original 'classics' like 'Gator Strut' or 'Scotch and Swing'. 400 listeners loved the show. Mike was also interviewed for the prestigious TV talk show 'Na plovarne'. Rosta is already working on preparations of Prague concerts of Gambetta and Crary, mandolinist Radim Zenkl, and more. Legendary guitar players Beppe Gambetta and Dan Crary are coming to the festival Jamboree in Strakonice in late May. The Doyle Lawson & Quicksilver show in Prague has been sold out, but the organisers (band Monogram, which is the opening act) managed to add one more show on 17 May, which also sells fast. Don Rigsby (right) & Midnight Call confirmed their appearance at the oldest European bluegrass festival - 39th Banjo Jamboree in Caslav on 18 June. Honza Macak, Banjo Jamboree founder and father of Bluegrass Cwrkot's mandolin player Marek, is struggling with stomach cancer. Currently, he is undergoing chemotherapy.